Read the Defective Inspector's report on last year's event. 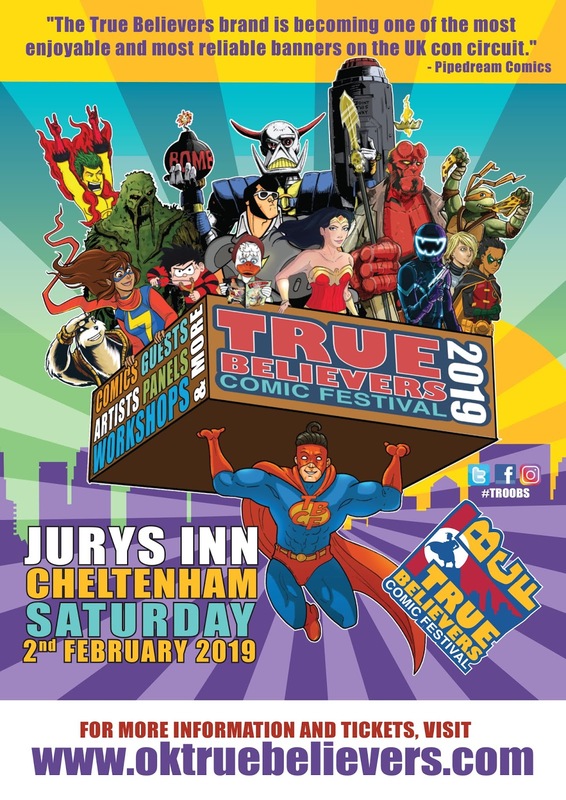 The True Believers Comic Festival – one of the best loved comic focused conventions on the UK calendar – returns to Cheltenham for a 5th year, which will see comic creators and fans from all over the country, converge on a new venue at Jury’s Inn, Cheltenham to celebrate all things comics. 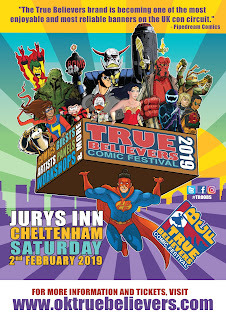 This year the event will feature big names from the UK Comic Industry such as Geoff Senior, Laura Howell, Jack Lawrence, Mike Collins, Rachael Ball, Dylan Teague, Robin Etherington and more, along with some exciting creators from the UK Small Press & independent comic scene, artists and writers, as well as tables full of comics and toys for collectors to dive in to. The event will also see several creators launching new comics and books on the day, offering fans the chance to pick up something new direct from the creator themselves on the day of release. There will be even more extra activities to get the creative juices flowing, with some of the guests and comic creators running workshops on comic creating and storytelling, some Learn To Draw classes, in which you can learn the basics of drawing iconic characters like Spider-Man and the return of the much loved Superhero Life Drawing class. There will also be a panel exploring the wonderful world of sci-fi in comics. This year will also see the return of the Celebrate Cosplay team, who will be on hand to pose for photos, talk cosplay, run workshops and host a 2019 Cosplay Showcase, in which everyone who has come in costume is invited to strut their stuff & pose for photos for the crowd of fans in the audience. Tickets for the event can be purchased online at www.oktruebelievers.com for just £6.50 each for adults or for £8 at the event. Children aged 12 and under can enter the event for free with a paying adult.